Like most organizations, you already know you need to drive toward digital transformation — or get left behind. But are you fully leveraging Box to help you do so? 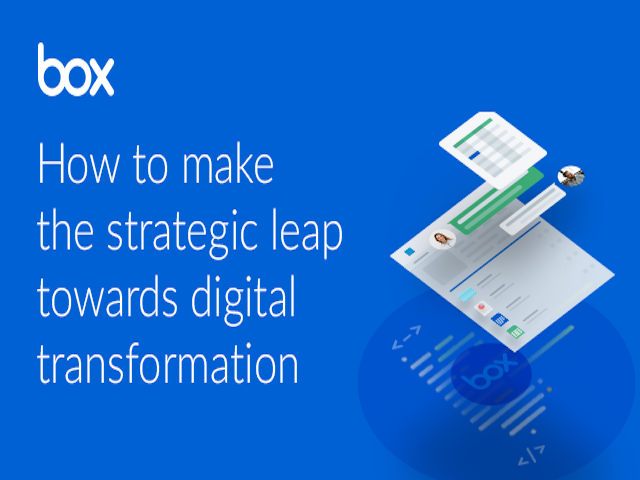 Join this session to learn how Box Transform, a white-glove program offered to ensure your success, delivers both the team and the experience to quickly bring your organization into the digital age. Tens of thousands of businesses running Office 365 choose Box over OneDrive and SharePoint so they can improve user and IT productivity, improve content security and protection, and reduce infrastructure costs. See a demo and learn why Box and Office 365 make such a winning combination. Watch this 25 minute demo and discover how easy it is to share files and collaborate securely with anyone, from any device. - Easily share any file from any device with a simple link, with anyone you want. - Preview full documents without needing to download the file first. Ready to discover what's possible with Box? Let’s face it: Cloud Content Management (CCM) is an investment in the future. While the payoff starts immediately, it’s not always easy to quantify by traditional metrics. How do you measure the bottom-line impact of a platform that helps you build a digital workplace? And how can you use those measurements to optimize your digital workplace investment. When the EU General Data Protection Regulation (GDPR) went into effect in May 2018, there was a lot of confusion about its impact. Today, the picture is more clear: multi-million dollar fines have been levied and companies have learned just how costly non-compliance with GDPR can be. Organizations still rely on network file shares and complicated VPN setups to safeguard corporate content. But your teams need what network file shares can't deliver: greater mobility, easier collaboration and better security. Watch this webinar to learn how the new Box for G Suite integration brings Google's rich content creation and editing experience for Google Docs, Sheets and Slides directly into Box's secure content management platform. Two-thirds of business executives believe they must speed up the pace of digitization to remain competitive. Yet only 42% have a digital-first strategy. That’s why we think you should know about Box Transform, a white-glove program offered to ensure your success, that delivers the team and experience to quickly bring your organization into the digital age. Many security teams today are overly restrictive with cloud content because they're worried what users might do. But putting today's workers in handcuffs only drives them to use workarounds and shadow IT — and that leads to security risks. Watch this informative webinar to learn how you can get the security you need — while giving users the freedom to share and collaborate on content. What are the best ways to keep your cloud stack secure, your business compliant, and your users safe? Getting straight (and useful) answers to these simple questions isn't always easy. Watch a candid discussion with Box CIO Paul Chapman and his counterparts in Security and Compliance as they reveal how they work together every day to tackle the complex security and compliance challenges every global business faces today. They'll share best practices, pitfalls to avoid, and answer your hardest questions. This isn't your typical webinar. No slides. No pitches. No filters. Just a candid discussion with the guys who are safeguarding the data for over 80,000 businesses — including 67% of the Fortune 500 — as they share best practices and insights. Join Box Co-founder and CEO Aaron Levie and Chief Product Officer Jeetu Patel to learn about all the news and innovation from Box. GDPR has been in effect for a few months now and we are starting to see hefty fines being levied for non-compliance. In a recent survey, 80% of companies said they are still in the early stages of planning and initial implementation. Where are you in your GDPR journey? Join this session to learn how to show that you are processing data in accordance to the GDPR, how Box helps you address critical GDPR requirements and how to easily execute your self-serve Data Processing Addendum (DPA). In this session, we explore the capabilities and common application patterns for the Box Platform; and provide an overview of our developer tools. By 2021, enterprises will experience an 8x increase in data generated — and 80% of that will be unstructured content.Organizations need a framework for creating structure and understanding their business content at scale by applying best-of-breed artificial intelligence technologies from the world's best providers around the industry. We're rapidly moving towards the age of Cloud Content Management, a world where digital businesses can easily leverage all their content for higher productivity, greater efficiencies and better customer experiences. Don't get left behind! When you do business with one SaaS vendor, you're also doing business with every other vendor they do business with. So one weak link in that chain could jeopardize your entire enterprise. Watch this webinar to learn best practices of vetting vendors for security and compliance with standards like GDPR, HIPAA , PCI DSS and more. Our business is built on security, compliance and governance — and that means we make sure all our vendors comply with strict guidelines and standards so we can safeguard our customers' security. Box is trusted by 69% of the Fortune 500, because of its track record for securing data in compliance with a host of regulations and standards around the world. This is your chance to hear from Box experts on what you can do now to ensure your business's data security. Until now, organizations have been using network file shares and complicated VPN setups to keep files off the desktop. But teams need what network file shares can't offer: greater mobility, easier collaboration and better security. If you're deploying Microsoft Office 365, you owe it to yourself to see how Box can help you power a best-of-breed digital workplace. Digital transformation is driving organizations to rethink the way they work. Businesses are under intense pressure to quickly swap old processes for new ones and do more with all the content that's the lifeblood of the business. Watch this webinar to learn how to effectively and securely manage your content flow with Cloud Content Management. We'll show you how easy Box makes it to collaborate from anywhere, simplify and streamlines processes, and securely integrate with existing applications — all from a platform that provides native security, governance and compliance. Box (NYSE:BOX) is the Cloud Content Management company that empowers enterprises to revolutionize how they work by securely connecting their people, information and applications. Founded in 2005, Box powers more than 82,000 businesses globally, including AstraZeneca, General Electric, P&G, and The GAP. Box is headquartered in Redwood City, CA, with offices across the United States, Europe and Asia. To learn more about Box, visit http://www.box.com/.